This is my favorite time of the year. I love when the weather gets colder and my kitchen heats up with slow roasted cooking. Don't get me wrong, I hate having to wear multiple layers and still being cold and my heating bills going through the roof. However, there is something so comforting about cooking in the fall and winter. As everyone has heard me say multiple times, I love my slowcooker. I pretty much use it at least twice a week all fall and winter. I have also shared many times my family's love of all things pork, so any dish combining the two is perfect. The December issue of Family Circle magazine had a recipe for Chipotle-Mango Pulled Pork which combined my family's favorite meat and my love of all things slow cooker related. This recipe has 13 ingredients. It takes 23 minutes of prep and 8 hours of cooking time and makes 8 servings. I had no problems finding any of the ingredients at my local grocery store, which the exception that I was only able to find a 8 pound bone-in pork shoulder, which I had cut in half. I actually prefer using bone-in pork shoulder, the bone adds an extra level of flavor to dishes. I served the dish over polenta, my family isn't big fans of grits. For the chicken broth I used homemade stock, I prefer the flavor to the store bought variety. I followed the remainder of the recipe as stated. I really enjoyed the flavor from the mango and chipotles. 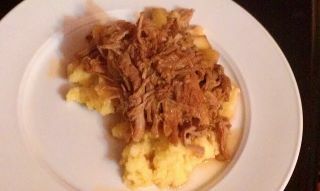 The combination of flavors was pleasant and added a flavor dimension to the pulled pork. The recipe states that it makes 8 servings, but there was enough for at least three meals for my family of four. With only 12 grams of fat and 346 calories, this dish is a great and easy weeknight meal. For the recipe go to Chipotle-Mango Pulled Pork. I'm finally going to try my slow cooker this weekend! I hope ya'll had a great Christmas! @The Blonde Duck You'll love using your slowcooker I promise! We had a great Christmas, I hope yours went great also! YUM! I love my slow cooker and can't wait to try out this recipe - here from the fashonable home blog hop and a new follower...hope you'll follow back! This dish looks great. I really need to start using my slow cooker more! I am visiting from the hop and now following you via twitter and your rss feed. @kate I love my slowcooker also, it is so great and easy! Thanks for the follow already follow you on GFC, so following now on networked blogs :) Have a great evening!